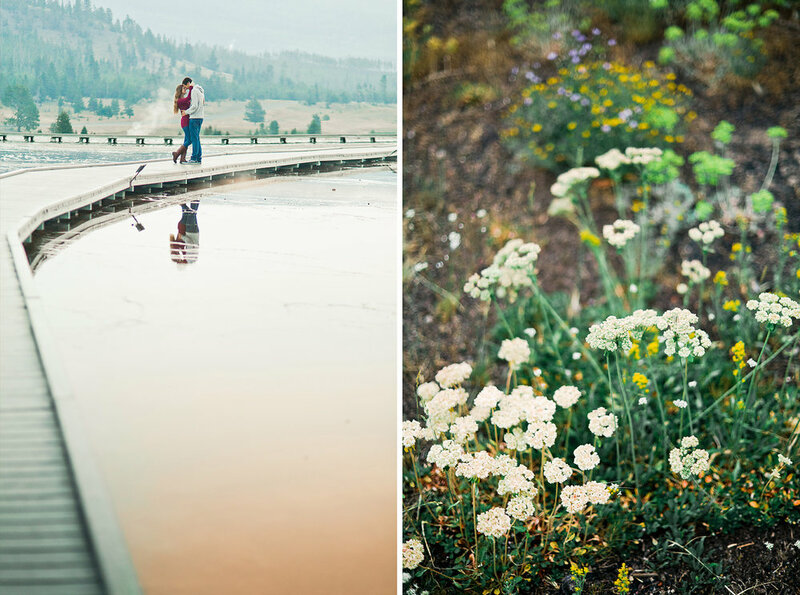 We only crossed paths with one man while we shot on the boardwalk by Yellowstone's majestic Grand Prismatic Spring. That's exactly the way I wanted it - specifically planning our shoot for sunrise, on a weekday, to avoid as few tourists on the boardwalks as possible. BLESS THEIR HEARTS because Peyton and Jeff woke up at nearly 3 AM(!!) 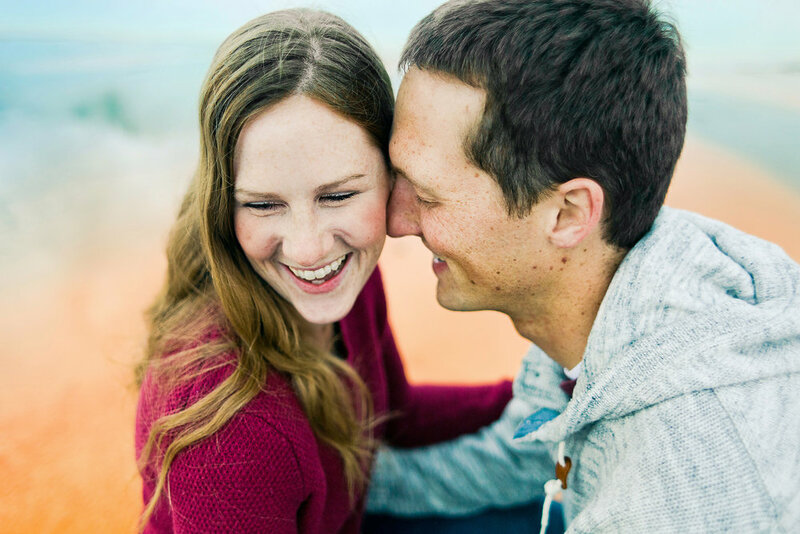 to come in from their home in Idaho to make it in time (and like, all that gorgeous auburn hair?! Peyton is literally a saint for prepping those locks so early in the morning). 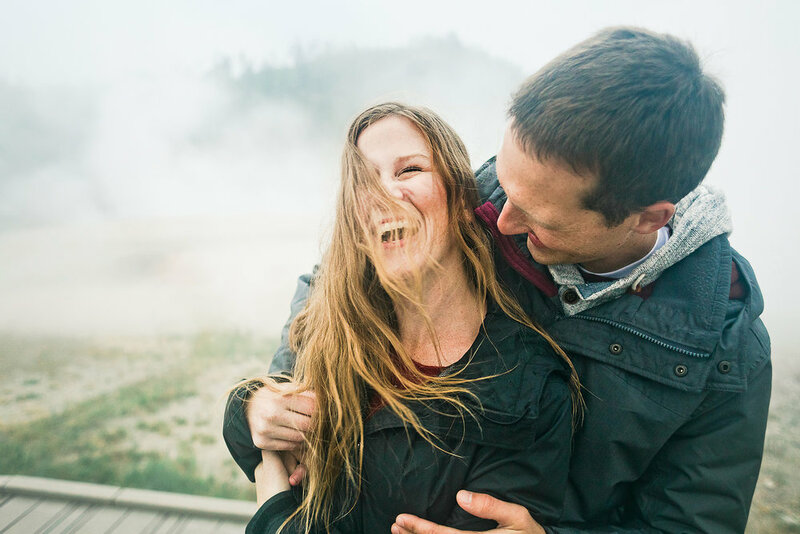 "My wife and I spend every anniversary here in Yellowstone" said the boardwalk man. 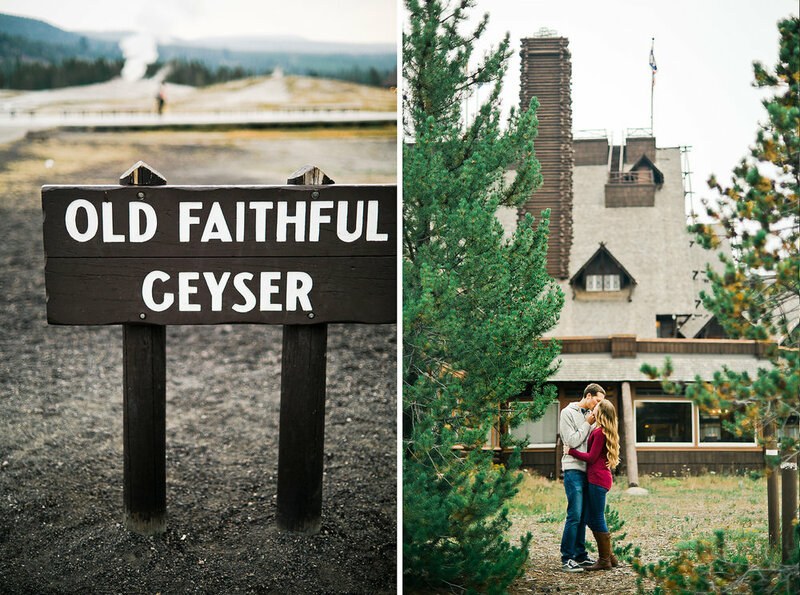 He explained that they were married 30+ years... inside Yellowstone National Park! Don't you love that?! At that point, I was just about ready to DITCH Peyton and Jeff and take pictures for this guy instead!! KIDDING. Obviously. 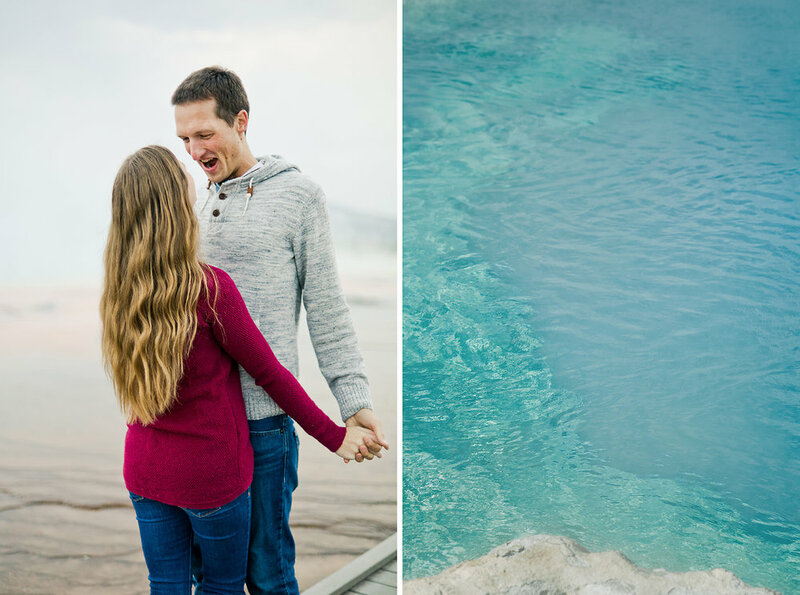 Shooting with Peyton and Jeff was an absolute dream - it was like their smiles got bigger each time the rain started coming down harder. And if you know anything about me, you know THAT is a quality I really love. I've always known that one day I would photograph in Yellowstone National Park. These two, on this rainy morning, filled my soul to the brim. SIGH. With big grey storm clouds hovering over the horizon, the Tetons turned to shades of hazy blue and periwinkle. The wind picked up, throwing dust and sagebrush scent through the air. Our periwinkle chiffon dress twisted in the gusty weather and I wish I could say...... YEP. TOTALLY PLANNED IT THIS WAY. In reality, this should have been a sunrise or sunset shoot. You know, those times of day that photogs love and gush over non-stop when they can't think of any other Instagram captions. It wasn't realistic for us to get out to the Tetons at that time because myself, my sister (pictured here), my dad (our personal location guide and driver who knew the way to all these spots), my husband (reluctant camera bag carrier) drove about two and half hours to get here from our place in Yellowstone AND we had gotten home at nearly midnight the night before from a much anticipated concert in Bozeman, Montana to see Tim McGraw(!!!) and Faith Hill(!!!) perform together. But my sister MADE THIS DRESS BY HAND and stuffed it in her luggage so we could do this, too. We had a groggy drive down, she did her makeup in the truck, we got there in the middle of the day (notoriously a terrible time of day for portraits) and the stars aligned with THE most grand, photogenic, epic clouds you could possibly ask for. I look back at these pictures and think, "We could not have planned this any better" when really the truth is, "We did not really plan this at all and got freaking LUCKY". Insert pun about Faith (((Hill))) here. Wink. Praying hands emoji. And here's that vid! 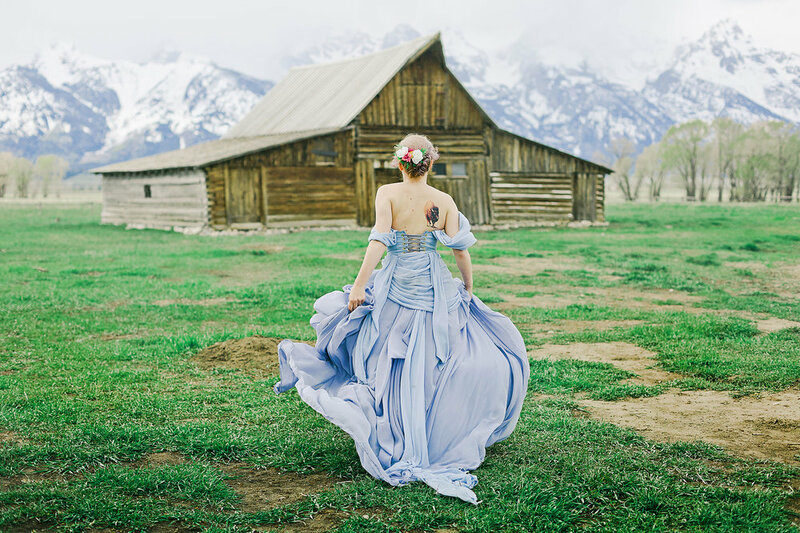 Like I said, planning this Teton inspired shoot and making it happen was amazing. But 'amazing' doesn't even come close to how it felt to TOUCH. FAITH. HILL. Floral hairpiece designed by Sheer Rose.